So what did this appallingly offensive interview do for Mayer’s music career? 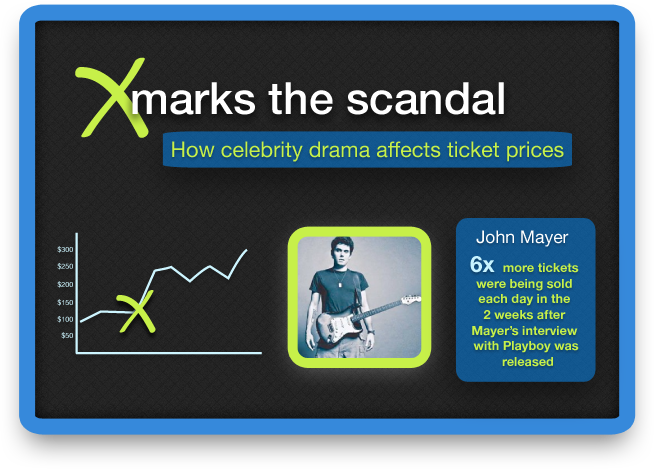 We looked at the fluctuation in ticket price for John Mayer concerts on the secondary market, as well as the change in number of tickets purchased during the weeks before and after the release of the interview on February 10th, 2010, and found dramatic spikes. In the month before the interview hit the news stands, Mayer’s concert tickets were selling at an average price of $119. In the two weeks after the interview was released, ticket prices climbed to an average of $235. In addition, 6x as many tickets were being sold on the secondary market in the two weeks following the scandal, and it didn’t stop there. With the increasing amount of bad press, John Mayer tickets were averaging $254 in March and, by the end of April, were selling for an average price of $280. We all remember the uproar surrounding the 2009 VMAs, after Kanye West crashed the stage and interrupted Taylor Swift’s speech, protesting that Beyoncé (not Taylor) had one of the best videos of all time. Unfortunately for Kanye’s career, he was not on tour at the time of the incident. Swift, however, reaped the benefits of the publicity surrounding the scandal. In the month before the event, Taylor Swift’s concert tickets were averaging $127 per ticket, but after Kanye grabbed her mic on national television, the average ticket price soared to $166. Ironically, Kanye’s doubts about Swift’s talent ended up helping her career. Before going into retirement this past January, Brett Favre was the quarterback for the Minnesota Vikings. The only quarterback to throw the ball over 70,000 yards, fans filed into stadiums to watch Favre in action, but it was not Favre’s athletic ability that was selling Vikings’ tickets in the fall of 2010. On October 8, 2010 the NFL began investigating Favre for leaving inappropriate voicemails and texts for Jenn Sterger, the Jets’ sports reporter during the 2008 season. What effect did this have on ticket prices for the Vikings? In August and September, before the Favre scandal, Vikings’ tickets were selling for an average of $103. With all the buzz surrounding Favre’s investigation, the ticket price on the secondary market jumped to an average of $134 per ticket. So what is the take home message here? Racism, inappropriate outbursts, and sexual misconduct lead to a more successful career? Hopefully not, but the data clearly displays that the publicity surrounding these events helped to increase ticket values. Find this interesting? Check out SeatGeek’s data regarding the Gender Divide in Standup Comedy or our look at the best live artists.